After a sixteen-year hiatus, Kiran Manandhar has made a colorful return with Shakti, his fourth solo exhibition at the Siddhartha Art Gallery. The highly-revered Nepali artist’s latest collection explores both the mortal power and divine energy manifested in the female form. Manandhar is both prolific and world-renowned. 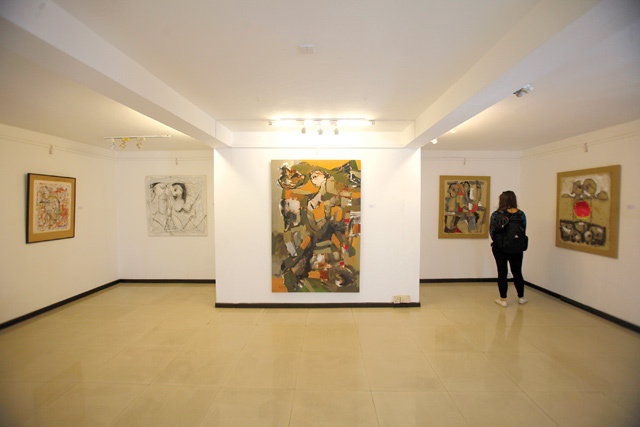 The recipient of numerous international awards, he has worked hard to be recognized and appreciated in Nepal’s fine arts scene. In this particular exhibit, which is spread out on all three floors of the gallery, Manandhar explores the themes of sensuality, love and freedom. In some of his paintings, like that of the goddess Durga with her tiger, Manandhar explores the deification of female power. Relying heavily on red and yellow hues (auspicious colours in Nepal) Kiran creates a post-modern, abstract figure of the goddess. Other paintings are influenced by Nepal’s pastoral scenes, depicting images of mountains, clouds and rivers. The mix of earthy tones and vibrant colours combined with the artist’s signature bold, powerful lines will captivate art lovers. In an effort to create something refreshing, Kiran experiments with his composition, colour and texture. In many of his acrylic pieces on canvas, his brush strokes create different layers that often make it difficult to determine the exact shapes or figures of the women or men in his paintings. In this way, Kiran’s pieces often remind us of the famous paintings of Picasso. Stylistically, there are some similarities. Like Picasso, Kiran uses colour as an expressive element and often depicts women and men as floating figures in his paintings. In many of his scenic paintings of mountains, one can see the abstract expressionist influence of Jackson Pollock. While his art may have hints of Western influences, the essence of Kiran’s exhibit Shakti remains the landscape, culture and deities of Nepal and the embodiment of power and strength in the female figure.